Located southwest of Pittsfield, Bousquet is amongst the oldest ski areas in the country. A second tow was added for the 1936-37 season, as Bousquet quickly became a well-known ski area. A third tow was likely added for 1937-38, while a fourth debuted for 1938-39. 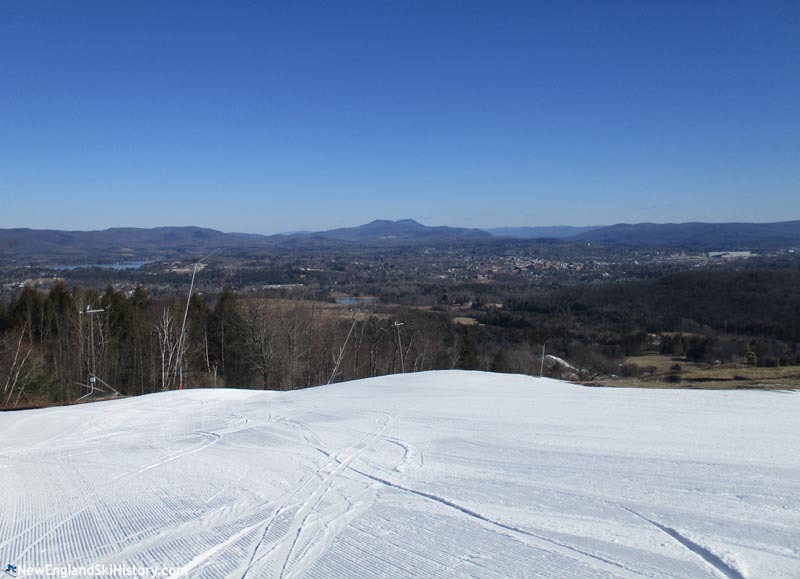 The Hartford Courant declared the area "one of America's finest ski developments," citing the longest rope tow in the world. 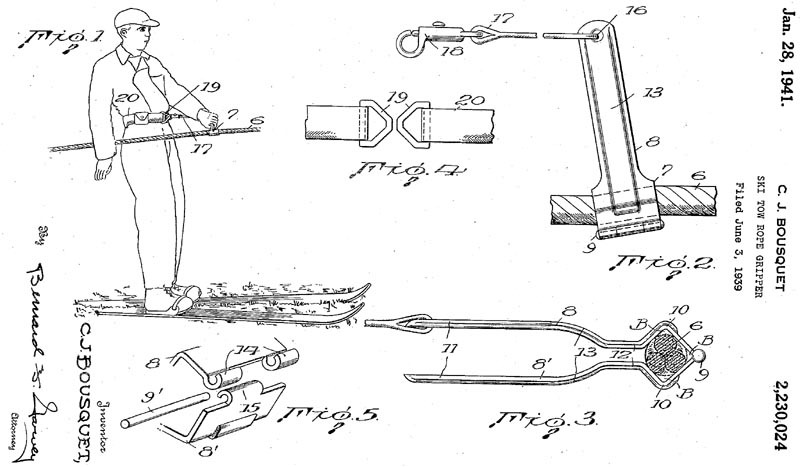 Meanwhile, Clarence Bousquet was trying his hand as an inventor, designing a rope tow gripper. His 1939 filing was patented on January 28, 1941, publication number US2230024 A. The C.J. Bousquet Ski Tow Rope Gripper resulted in hundreds of thousands of sales, making rope tow riding dramatically easier for skiers all over. For the 1939-40 season, Bousquet advertised seven trails and 200 acres of open slopes. Two more tows may have been added for the 1940-41 season, as the area recorded up to 4,000 skiers per day. 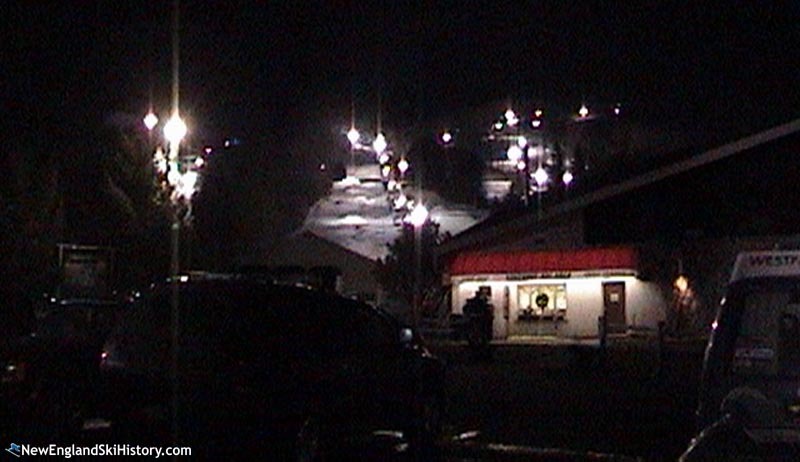 Three tows were open for night skiing. Improvements continued for the 1941-42 season, as a large base lodge was constructed. Growth continued following World War II, as Bousquet sported 10 rope tows for the 1947-48 season. Growth also continued at competing areas, however, as Catamount expanded to 11 tows in 1949 and areas up north started installing chairlifts, T-Bars, and even a tramway. Meanwhile, sons Paul and Russell started managing the ski area. Bousquet was sold to Don Soviero circa 1956. Soviero made an immediate splash by installing a foot 2,500 T-Bar, served by snowmaking. A new canteen and ski shop also debuted. Thanks in part to the snowmaking, the area operated for 82 days that season. Two Poma lifts were installed for the 1957-58 season, further modernizing the operation. Snowmaking was also tripled, as Bousquet would claim to be the world's largest machine-made snow facility for some time. In addition, Soviero brought in legendary architect Frank Lloyd Wright to transform Bousquet and adjacent land into a Sun Valley-like four season resort. Unfortunately for Soviero, the financial supporters of the project backed out before it could see the light of day. Bousquet stepped into the chairlift age in 1962-63 with the installation of a Carlevaro & Savio double. Soviero likely sold the area prior to the 1967-68 season to a group of local businessmen. 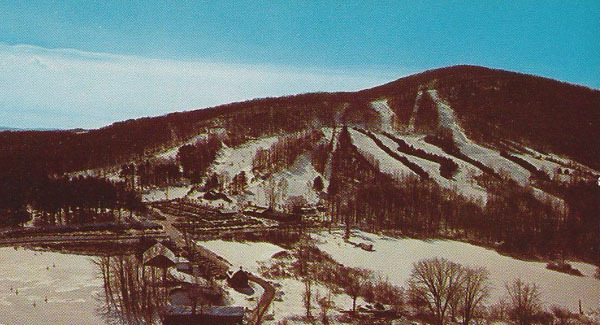 Paul Bousquet returned from Killington to purchase the ski area with a group of partners for the 1968-69 season. A 2,600 square foot base lodge addition was constructed for the 1972-73 season. 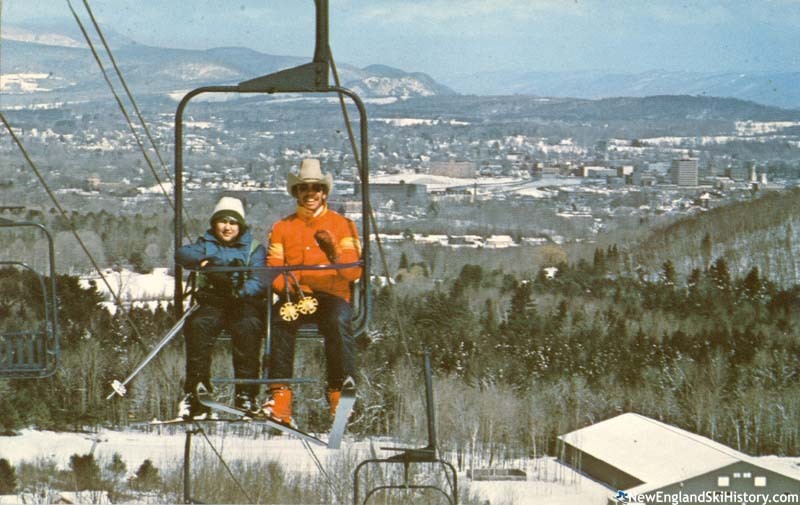 A second double chairlift was installed for the 1980-81 season. Unfortunately for ownership, they soon found themselves foreclosed on by First Agricultural Bank. In 1981, Four Skiers Enterprises, led by former Butternut employee George Jervas, purchased Bousquet. Jervas rolled out a summer operation circa the 1990s that included water slides, go carts, and a climbing wall. An aerial adventure park was added in the summer of 2011. Circa 2002, a Hall double chairlift was purchased from nearby Eastover and gradually installed at Bousquet, eventually being completed for the 2004-05 season. Around that time, Jervas suffered a stroke. Citing his health, he put Bousquet up for sale, but was unable to find a buyer. At the age of 76, Jervas suffered a fatal heart attack on August 20, 2012 while at work at Bousquet. His long-time partner Sherry Roberts inherited the ski area and was able to rally the troops to open the ski area for the 2012-13 season. Roberts vowed to keep Bousquet alive. "This is where I learned to ski. We always had a good time. Need to get back out there again, just because....."
"Wow. Memories. Worked fro Court McDermott , my mentor fro 1963 - 1976 ........had my infamous flip on March 12, 1967.. "
"I worked with George from the beginning for eight years and made a bunch of great friends George is missed"
"I grew up skiing and racing at bousquet, I'm now a back country guide for steamboat Powdercats. Great memories of friends!" "growing up in Pittsfield in the 70's I could see Bousquet from my bedroom window. First place I ever skied and continue to do so to this day. Will always support Sherry and Bousquet."